It’s the unofficial last weekend of the summer – Labor Day. You work hard so you deserve to play hard. And the best way to celebrate Labor Day in Destin Fl is on the water. Let our captains take you on a water adventure on the 45-foot sporty SunVenture catamaran. The SunVenture is a less expensive option than renting a pontoon boat and less stressful than taking your own boat out. Let our captains do all the driving and cleaning while you sit back, relax and cruise. The One and Only Crab Island: Crab Island is the center of excitement for Labor Day weekend as everyone anchors their boats for one of the last weekend celebrations at this underwater playground. We’re cruising twice a day to Crab Island – BYOB, restroom on board and our captains / boat stay with you the entire time. Seriously the best way to do Crab Island! And don’t miss the last live Crab Island concert of the summer, sponsored by CrabIslandOnline.com, featuring Paris Avenue playing live. Sunset Destin Harbor and Fireworks Cruise: What’s Labor Day weekend without some fireworks? Venture aboard for our last Fireworks Cruise of the summer on Sunday, September 2nd at 7:30 pm. 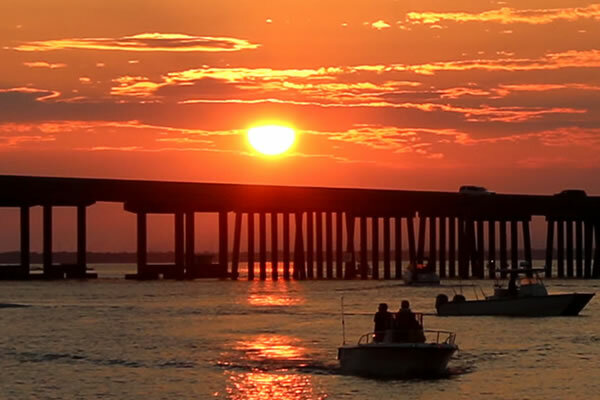 Cruise the Destin Harbor, watch the sun set over the Destin bridge and perhaps catch a dolphin or two. Then watch the sky above you illuminate with colorful fireworks – a perfect ending to the night. Dolphin Sunset Cruise: There’s no better way to end your day than on a chartered boat cruising into the sunset and an up close encounter with dolphins. The SunVenture takes daily dolphin sunset cruises at 6 pm. and offers one of the most up close and personal experiences with the dolphins. Make it a Labor Day weekend to remember – we hope to see you on the SunVenture this weekend! You can easily make a reservation online for any of our cruises.